Snapchat updated its in-app design last week and to say people hate it would be an understatement. The goal was to make Snapchat easier to navigate, but unfortunately the company seemed to have missed the mark. The new interface left many users confused and that confusion quickly turned to anger. Many users begged the social media app to go back to its original format. There was even a petition going around to reverse the update. The petition on change.org calls for 1.5 million signatures. Over 1.2 million people signed it as of Tuesday afternoon. 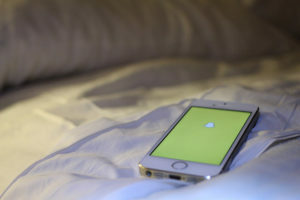 The petition to “Remove The New Snapchat” was started by Australian-based user Nic Rumsey, who reached out to Snap Inc. to reverse the update for the safety of their users. Many people avoided updating their apps, hoping to keep their original Snapchat setup. Slowly but surely though, many users started waking up to see their apps had automatically updated. Some argue that the older design shunned older people, which made some major advertisers hesitant to jump on the Snapchat train. “This was a much needed redesign for Snap as the complexity and nature of the app was shunning older demographics and a major issue for advertisers, which remain the golden goose for the company,” Chief Strategist at GBH Insights Daniel Ives told CNN. The hatred runs so deep that people are actually looking for ways to reverse the update on their own. As reported by The Sun, by deleting the app, turning off the automatic updates in your settings and re-downloading Snapchat, you can return to the original interface. Snapchat tweeted out a warning about the dangers of deleting and re-downloading the app. “Don’t believe everything you read on the internet- unofficial workarounds to change the way Snapchat looks are temporary and can result in getting permanently locked out of your account or losing Memories,” @snapchatsupport tweeted. Twitter account, @isaacsvobodny, tweeted out a screenshot of a direct message between him and @Snapchat claiming that if it gets enough retweets, they will rollback the changes. It has been retweeted over 1.5 million times. Unfortunately the tweet is fake and Snapchat never sent such a message. Furthermore, Snapchat has no intention of getting rid of the new, controversial changes. The CEO of Snap Inc., Evan Spiegel is happy with the redesign and says that we basically need to get used to it. The redesign was meant to separate communication between users from publishers like Vice and Cosmopolitan. Spiegel spoke out about the controversy at Goldman Sachs Internet and Technology conference in San Francisco on Thursday, Feb.15. He explains the reason behind the change was because he was worried that users couldn’t tell the difference between friends and celebrities. In the past, social media users have been reluctant to change. When Facebook came out with a new design, the Facebook groups “Petition Against the New Facebook” and “1,000,000 Against the New Facebook Layout,” emerged on the platform. Both groups had over a million members. Even Instagram faced major backlash when they added a “Stories” section to their app back in 2016. But since the new launch, the app now carries a 1.8 rating in the Apple Store. By putting messages and stories on the same feed, research has shown more Snapchat users are switching over to Instagram. There have been a surge in tweets about switching over to Instagram, according to LikeFolio, a social-data website used by investors. About 80 percent of all tweets about Snapchat are negative, according to research conducted by LikeFolio. The founder of LikeFolio said the reaction to the update is worse than the reaction to the Chipotle E.coli breakout in 2015. Snapchat understands the inner struggles of the snapper trying to navigate the new interface but is hopeful that they will adapt to the new changes. “Updates as big as this one can take a little getting used to, but we hope the community will enjoy it once they settle in,” a Snapchat spokeswoman said in a statement.